Squire, J.C. (ed.). If It Had Happened Otherwise: Lapses Into Imaginary History . St. Martin's 1974. Squire, J.C. (ed.). If It Had Happened Otherwise: Lapses Into Imaginary History . Translated to the German as Wenn Napoleon bei Waterloo gewonnen hätte , Heyne 1999. Comments: The classic alternate history anthology. The original edition includes Hillaire Belloc's w88 android, G.K. Chesterton's "If Don John of Austria had Married Mary Queen of Scots", Winston S. Churchill's "If Lee had not Won the Battle of Gettysburg", H.A.L. Fisher's "If Napoleon had Escaped to America", Philip Guedalla's "If the Moors in Spain had Won", Ronald Knox's "If the General Strike had Succeeded", Emil Ludwig's "If the Emperor Frederick had not had Cancer", André Maurois' "If Louis XVI had an Atom of Firmness", Harold Nicolson's "If Byron had Become King of Greece", J.C. Squire's "If It Had Been Discovered in 1930 that Bacon Really Did Write Shakespeare" and Milton Waldman's "If Booth had Missed Lincoln". Revised edition (with alternative title) replaces Knox with Hendrik Willem Van Loon's "If the Dutch had Kept Nieuw Amsterdam". The expanded edition adds to the original contents Charles Petrie's "If: A Jacobite Fantasy" and G.M. Trevelyan's "If Napoleon had Won the Battle of Waterloo". Published: As If It Had Happened Otherwise: Lapses Into Imaginary History , Longmans, Green 1931. Published: Revised edition as If: or, History Rewritten , Viking 1931, Kennikat 1964. Published: Expanded edition with original title, Sidgwick & Jackson 1972 (028397821XBUY), St. Martin's 1974. 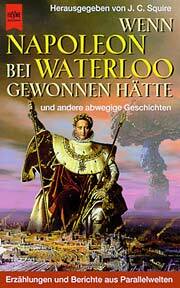 Translation: German of expanded edition by Walter Brumm as Wenn Napoleon bei Waterloo gewonnen hätte. Und andere abwegige Geschichten , Heyne 1999 (3453149114). This voume also includes one additional non-allohistorical essay, and also refers to Erik Simon's Alexanders langes Leben, Stalins früher Tod und andere abwegige Geschichten: Erzaehlungen und Berichte aus Parallelwelten , q.v., as a companion volume.